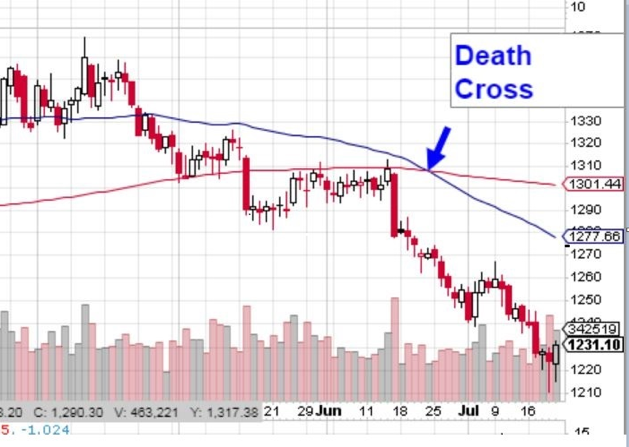 The financial news networks have been abuzz talking about the "Death Cross" that appeared on the gold chart this summer. A Death Cross sounds pretty scary. Don't worry, it's not. A Death Cross is just a term that traders use when the 50-day moving average falls below the 200-day moving average. That was an invitation for Day Traders to jump on the short selling bandwagon, which pushed the gold market lower in recent weeks. You've heard the saying: Markets Aren't Rational. This is a classic example of where that applies. The gold market is being driven by day traders who are running the market lower based on the Death Cross. Here's why you should ignore the Death Cross: the "fundamentals" are getting increasingly out of whack for the price of gold. A trade war could be one of the greatest risks to not only the American economy but the global economy in the months ahead. Read more on that here. Inflation just hit a 6-year high, the Labor Department reported in mid-July. That wipes out wage gains for the average American, according to the Chicago Tribune. An "inverted yield curve" is another technical term, but guess what? It's also a solid Recession Indicator. The last seven out of seven times the yield curve went negative since the 1960s, a recession followed, according to CNBC. It refers to when short-term interest rates rise above long-term interest rates. It's starting to happen now! The Day Traders who've pushed gold prices lower are doing Long-Term Gold Investors a big favor: they are creating better price levels to enter the market! Here's what the World Gold Council said: "Gold’s recent pullback is supportive of consumer demand, as low prices tend to spur buying; at the same, it may provide attractive entry levels for investors." While for short periods of time, markets can become "irrational" and day traders can create market prices that are out of whack with the macro economic outlook. That is exactly what's happened in gold this summer. What's next? "We believe that the confluence of key trends, as highlighted for the second half of 2018, could be supportive of gold demand," the World Gold Council says. Gold has fallen to what may well be the lowest levels of 2018. Momentum is beginning to turn. There are major economic developments at play that could drive gold prices sharply higher in the second half of the year. There's never been a better time to buy gold. What are you waiting for? Give Blanchard a call today.